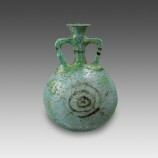 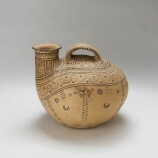 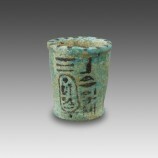 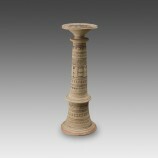 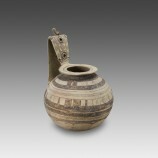 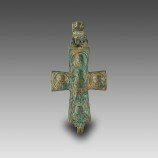 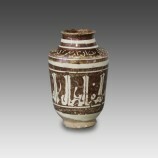 Despite a slight formal asymmetry, this vessel is remarkable for its artistic and technical qualities. 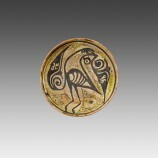 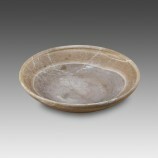 The profile is rounded, the disk-shaped base is flat, the upturned lip is in relief. 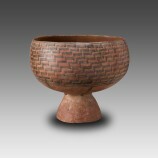 A medium-sized, perfectly circular phiale, with a low wall. 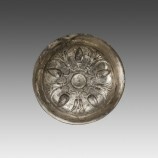 The body is hollow with a very flared rim; it was hammered from a single, thin sheet of silver. 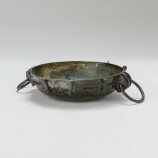 This bronze cast vessel was polished, while the handles and decorations were hammered and/or decorated in repoussé.